For this recipe you will need a bone-in standing rib roast, dried thyme, dried rosemary, black pepper, granulated garlic, granulated onion, salt, coriander seed, olive oil, carrots, celery, onions, beef broth, red wine unsalted butter. 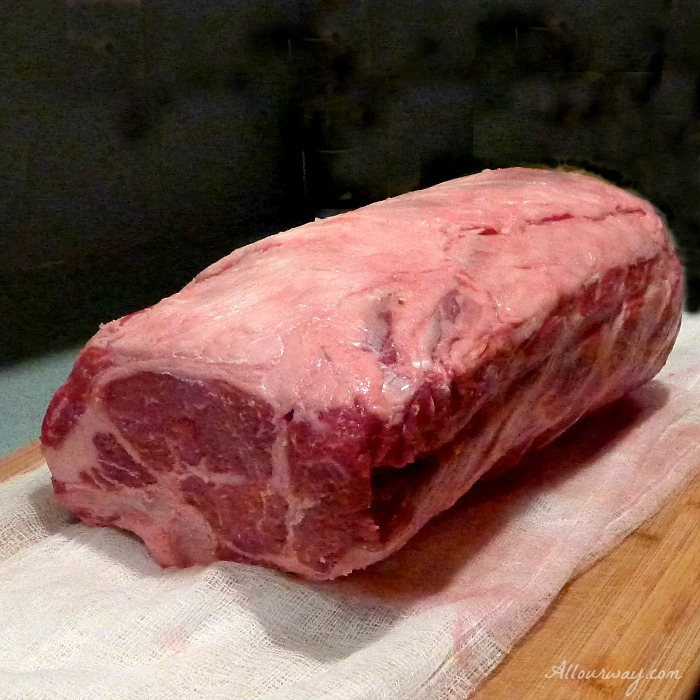 Why dry age a standing rib roast? Moisture evaporates from the muscle. The drying process creates a greater concentration of beef flavor and taste. Beef’s natural enzymes break down the connective tissues in the muscle which leads to a more tender beef. Don’t you wonder why your steak at an expensive restaurant tastes so much better? It’s because the steak or roast is dry-aged. Preparing to dry age the standing rib roast. Two weeks before Christmas Eve we ask our butcher when he’ll be getting his standing rib roasts. For a dry aged standing rib roast you need anywhere from six to nine days, depending on the size of the roast. You know the song “What a Difference a Day Makes?” Well, for the roast, the difference is in those six to fifteen days. I won’t go into the chemical reaction that takes place in the dry aging process — lets just say that it works like magic. Preparing the standing rib roast for dry aging. 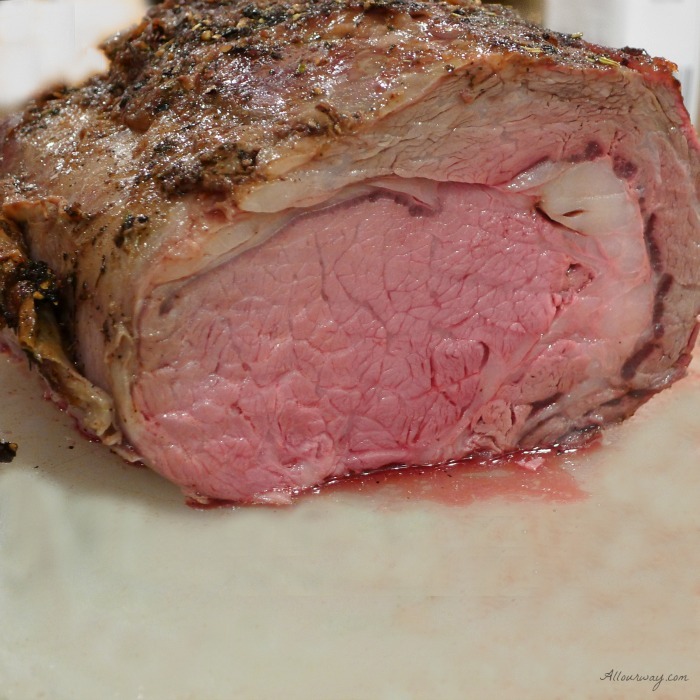 Is there a difference between a standing rib roast and a prime rib roast? All prime rib roasts are standing rib roasts. Not all standing rib roasts are prime rib. A prime rib roast is a standing rib roast from a beef that has achieved a USDA Grade of Prime. What do you need to dry age beef at home? Good air flow around the meat to properly age. A temperature of 34°- 38°. Bacteria thrives above 40°. Time depending on the size of your roast. Our seven rib roast took 15 days. 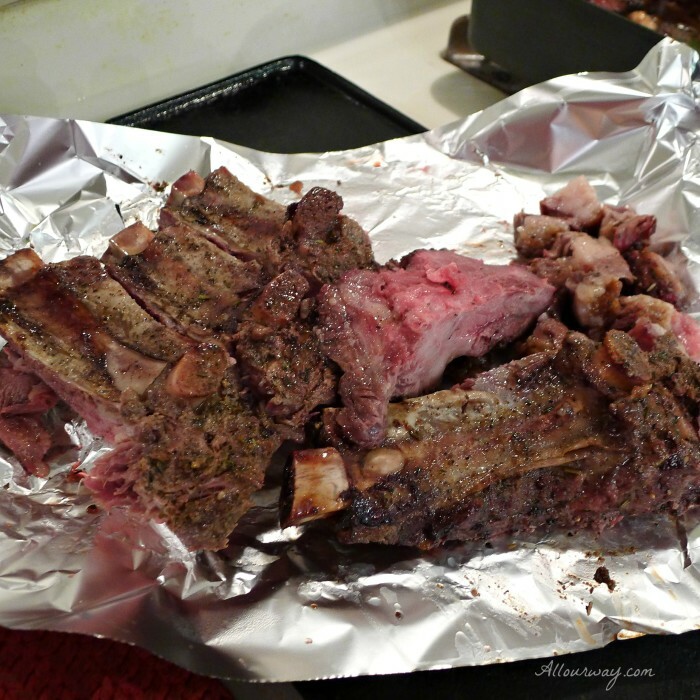 How long do you cook a standing rib per pound? Estimate about 15 minutes of cooking time per pound of standing rib roast. How can I tell if the meat is spoiled? Smell — It has a pungent smell that makes you turn up your nose. Texture — Along with the awful smell the meat is sticky or slimy to the touch. Color — Rotten meat will undergo a color change. If your beef turns green or greenish brown, toss it! Wrapping the meat in cheesecloth for Dry Aging the Standing Rib Roast. The first time we dry aged our Choice Standing Rib Roast, we were amazed at the difference! The flavor was incredible and the texture was as tender as what you’d find in a top-notch restaurant. We got the incredible flavor but didn’t have to pay the astronomical price. This recipe was supposed to be posted last year so that you could have it for the Holidays this year. But fate or better yet hungry tummies interfered. Why no documentation of the sliced rib roast? I had plenty of photos of the standing rib roast. How we prepared it for drying. What it looked like after it dry aged. How it looked when it came out of the oven. No photos of the end result. Dry Aged Standing Rib Roast is Resting before slicing. No record of a beautiful standing rib roast! Honestly, this is not an excuse, well, I guess it is, just a little bit. But you see, we started getting everything else ready for plating and before we knew it the roast was sliced and gone. Dry Aged Standing Rib Roast is finished resting and now ready to slice. In desperation, I thought of a Plan B. Honey and I could go to a high-end restaurant, order a salad, and then wait to see if anyone ordered prime rib. I would then grab my camera, politely ask the patron permission and then get a photo of what a slab of standing rib looks like on a plate. I knew that was a pretty far-fetched idea, but I really, really wanted that photo. At first, I was a little upset with myself for not being quicker with the camera, but then how could I stay upset when there were such sounds of total enjoyment and appreciation coming from around the table? We are a pretty informal family who really appreciates good food — from the youngest to the oldest! A perfectly cooked Dry aged standing rib roast. But this year would be different! I would have a record of the entire process. I warned everyone ahead of time that I’d need a minute or two, or three, to get a shot of the finished roast trimmed and sliced. I kept the camera an arm’s length away, and the minute my Honey started to slice . . .
. . .I was there to aim and shoot. I am pleased to say that our hungry family was very patient. And now, I have my shots of the whole process, including what the dry aged standing rib roast looks like sliced. The Dry Aged Standing Rib Roast turned out a perfect medium rare and I must say, and everyone else concurs, that it was even better than last years. To prove how good the beef was, at the start of dinner, as we were enjoying our meal I told everyone not to throw the bones away. I had planned on freezing them and using them for broth. Meaty rib bones from the dry aged Standing Rib Roast. We hope you try aging standing rib roast. All you need is a bone in standing rib roast with its fat, a sheet pan with a rack to fit inside the sheet pan, cheesecloth and space in the back of your refrigerator. Thanks so much for being a part of All Our Way. Taking the time to dry age a standing rib roast will produce a high quality piece of meat that concentrates the flavor of the roast. 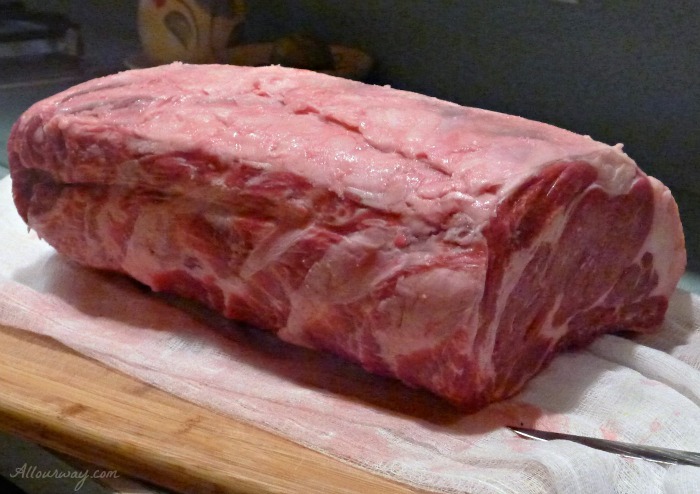 This is the type of standing rib roast that you’d find at the most expensive restaurants. The meat is full of beef flavor and the texture is fork tender. This is certainly a meat for a celebration. 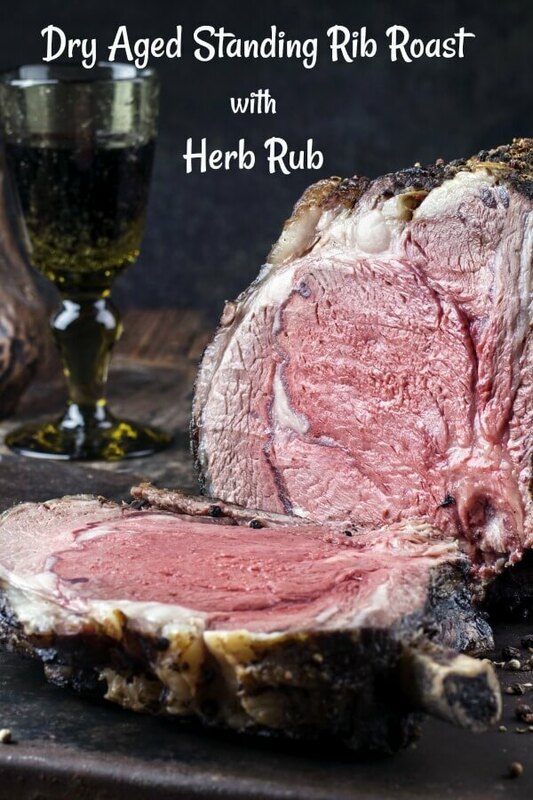 All you need to have a top-notch rib roast is to cover it with an herb seasoning, roast it, and wait for the accolades. You don’t need a Prime Rib Roast. We guarantee that your family will be like ours, insist that the roast becomes a Christmas tradition. If you like this recipe, please consider giving it a five-star rating. 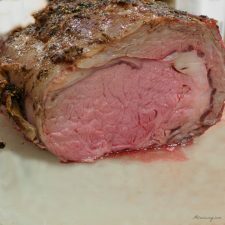 A bone in standing rib roast is aged in the refrigerator, then seasoned and roasted on a rack over a bed of vegetables. The aging makes for a tender and very flavorful meat. Remove roast from packaging, rinse well. Pat completely dry, wrap with 3 layers of cheesecloth. Place on a rack on a sheet pan in back of refrigerator, fat side up. After 24 hours, remove, unwrap, discard cheesecloth and wrap with a fresh piece. Place back in refrigerator for 6 to 9 days undisturbed. Remove roast from refrigerator. Remove cheesecloth, cut away the fat and trim the ends and any discolored parts of the roast. Place roast on a rack in a large, heavy roasting pan. In a medium bowl, combine spices and mix well. Be sure to crush the larger spices well for a uniform rub. A food processor works well for this. Rub roast with olive oil, then rub with seasoning. Let rest for 20 to 30 minutes. Prepare vegetables, make a bed in the roasting pan with the vegetables and pour in the 2 cups beef broth. Be sure to check the liquid level in the pan occasionally and add some water, if necessary. (You will need this liquid to make the au jus.) Place the rack holding the roast on top of vegetables and place in hot oven. Roast at 450 degrees F for 40 minutes. After 40 minutes, reduce heat to 325 degrees F and continue to roast for approximately 2 hours, or until internal temperature (stay away from the bone while checking temp) reaches 130 degrees F. This is for medium rare. Remove from oven, remove from roasting pan, loosely tent with foil and allow to rest for 25 minutes while making the au jus. Strain drippings from roasting pan, skim fat from drippings. Place roasting pan over 2 burners, heat on medium high and add in drippings, stir to deglaze, add in wine and stock, reduce by 1/3, about 5 minutes on steady boil, stirring occasionally. Turn off heat, add in butter. Season to taste with salt and pepper. Strain once more into serving vessel. The roast will need about 10 minutes per pound to reach the internal temperature of 130 degrees F. Remember that the roast after it is aged and trimmed will weigh less than what the weight was when purchased. We purchased a 14 pound roast and after it was dry aged and trimmed it probably weighed about 2 pounds less. If you like your roast a little more done, a trick we learned is to briefly put the roast slice in the hot au jus. This way you'll prevent drying out a delicious standing rib roast. Note: Recipes and content from ©2014-2018 All Our Way is copyright protected. Please do not use content or recipe without prior written permission. If you want to share the information please link to this post. Grazie. Hi, Maria!! Yes, we double the cheesecloth around the roast and then if we run out, we get another one for the next day. Sorry about not being clearer. Oh my that roast is mouth watering. That is quite a process but your roast is certainly worth every step. Oh gosh. I am drooling looking at that piece of meat. And I can relate about not getting the shots because everyone devoured it before you had a chance. I would love to dry that dry aging, but honestly, with the fridge packed and my making tons of seafood for Christmas Eve, I don’t know how I’d have space for the roast. I usually make a rib roast or a tenderloin for Christmas but I store it in a cooler on the deck. Do you suppose doing that with your procedure and leaving it in a cooler would be the same as dry aging in the fridge? Ciao, Linda! I’m so sorry it wouldn’t be the same in the cooler. It’s necessary that the air circulates around the roast. A crust forms on the outside protecting the meat inside and allowing it to age. I can only imagine how much the time put into this pays off! 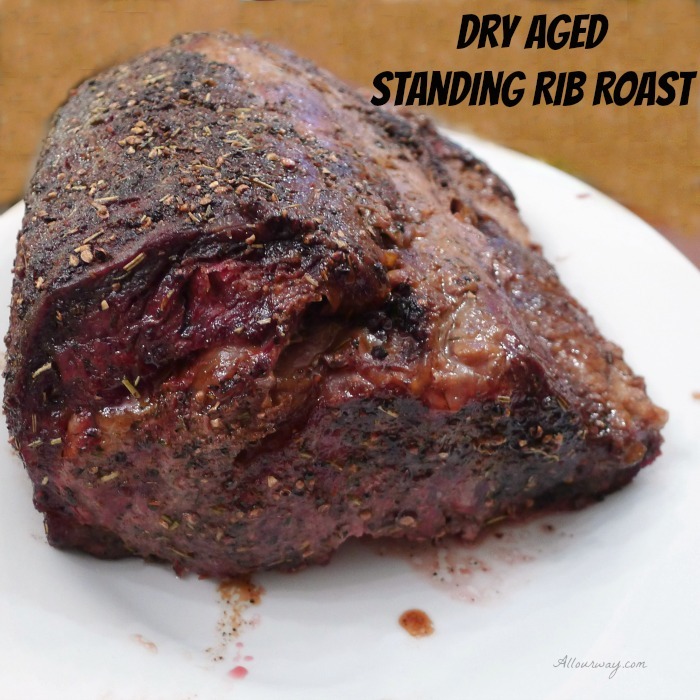 I absolutely LOVE making standing rib roasts, but I’ve never tried dry aging it at home. Mostly because I’m not so sure where I would dry age it. I don’t live somewhere where the temperature outside provides enough consistency to make an aging cellar, so I guess i would have to try another place! I can’t wait for the tender and juicy results! Hi, Mackenzie! You don’t need a special room or special equipment. All it takes is to make room in a refrigerator. We have a second refrigerator and we put it on the bottom rack. It needs to have air circulating around it. Very easy. This is one of our favorite things to make over a weekend when we’re not rushed. So succulent, and SO much flavor! Now this is what I call a meal!! Perfect for a large group, your explanation de mystifies the whole day age process! That you, so many folks are intimidated by recipes such as this and there really is no need! It’s similar to my coffee rubbed sirloin tip roast, dead simple but stunning results that make people think it’s hard to cook. Wow, this rib roast looks so tender and juicy. My husband will love this! t would be the perfect addition to Christmas dinner!! Oh my goodness, this would be such a showstopper during the holidays! I would love to make this, and the spices and flavors in this sound so delicious and tasty! I loved the pictures and descriptions with this post, and I feel so inspired to make one myself! I’ve never made a standing rib roast because there are just two of us. I need to host a dinner because I’m dying to try this! I’m always so apprehensive about preparing a whole rib roast …but your instructions make it seem fool-proof. The dry-aging sounds well worth the wait! My grandmother has always made a rib roast and ham for Christmas. Since I won’t be home this year, the hubs asked if I could make a version. Because I have not made my own yet, I’m going to try this next week and see how it turns out! This looks absolutely amazing, Marisa Franca. I would need to arm myself with patience for those 15 days of aging, but from the photos I can see that it’s very much worth the wait. Marisa, this is AMAZING! We usually do a roast for the holidays but your dry aged one would blow ours out of the water. I’m going to have to give it a try, I love a good herb rub, can’t go wrong with it. I had never heard of dry aging rib roast, but I must say I’m intrigued. It definitely looks like it makes the roast more juicy and flavorful at the end. And that herb rub sounds to die for! I can’t wait to try this! Great tips on how to properly prepare a delicity’s rib roast. I must say yours looks so tender and cooked just right. Is there an extra place at the table Christmas eve. Lol. I have definately learned and lot more and out dry aging. I have tasted the difference and dry aging does give you and out more tasty tender result. Ciao, Loreto! We’ve done it both ways — plain and dry aged. There is a concentration of flavor in dry aging that there isn’t in the plain roast. You’re welcome anytime — and your lovely bride. Oh my goodness this looks delicious. Want to try your rub my family would love this meal. 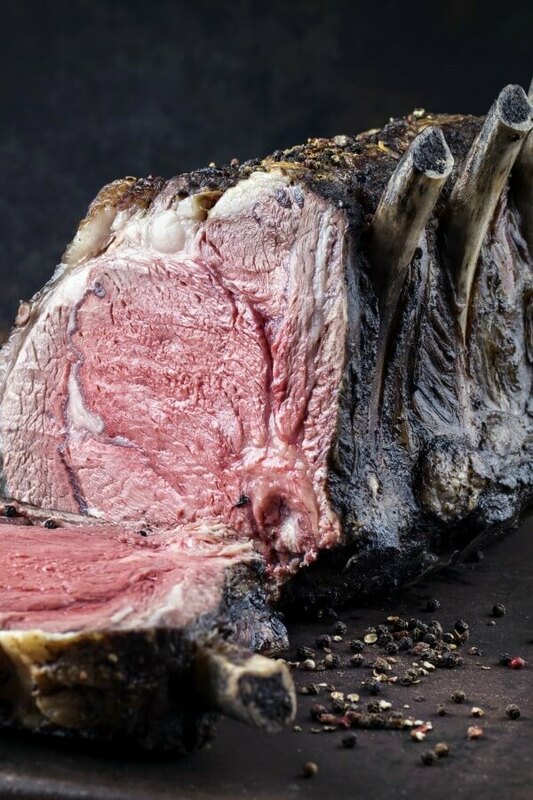 This rib roast looks incredible! It almost makes me wish that I was cooking for a crowd this year so I’d have an excuse to age and roast for a crowd. This is SO incredibly juicy and tender. I’ve been toying with what to make for Christmas dinner this year. Some years I do lasagna, some years, turkey and all the fixin’s. I think this year, we’ll have to rock this roast. I certainly don’t blame your son for wanting to take those bits home to clean off the bones. Haha. Hahahaha! I’ve totally been that person who makes a group of people wait while I snap some photos. NO SHAME! Man, Marisa. This looks absolutely incredible. Can I come over for dinner next time? LOL! I had no idea you could make your own dry-aged beef in the refrigerator! That is genius. I know that when I share this with my husband, he’s gonna want to do it for sure. BTW – Your family is WAY more patient than mine — they wouldn’t sit around patiently waiting for me to snap a photo — especially not of a rib roast like this one. Gorgeous! What a great holiday meal. I know the guests would LOVE this. Look at that presentation. Certainly a show stopper. I would love some leftovers, but I can imagine people will be fighting over the last piece of this juicy, delicious meat. Thanks for the tutorial. I had no idea what dry aged even meant, let alone that it’s not what the butcher does, but what you can do yourself at home! Who knew? I think my boys will love this preparation and I appreciate your step by step with clear photos….I”m going to give it a whirl. Looks and sounds so tasty. Going to give it a try. That looks like a perfect roast Marisa. I love how well you have explained it. My kids love red meat so this they will surely enjoy. Can’t wait to try. I always wondered how they dry aged beef. I would always worry about poisoning my family but I see that is a ridiculous thought now. This is something that we would definitely eat for Christmas. I’ll have to pass this recipe on to my sister as she is hosting and usually makes prime rib. Delicious recipe yet again! Thanks for this valuable information, Marisa! The roast looks delicious! What a beauty! Love your recipe. Oh wow. That is perfectly cooked. Ours is hit or miss, can’t wait to try this. I hope it becomes a tradition in our house too!! Now, this is MEAT!! What a great and delicious way to feed a crowd during the holidays. I don’t know a single person that would not welcome this at the dinner table. So many ways to use leftovers too (if you are lucky enough to have any). Wishing you a wonderful holiday season…and LOTS of great food!! That looks really juicy and I can see why it has become a tradition. The seasoning sounds wonderful. That is a perfect rib roast! I have never tried dry aging but I am now! 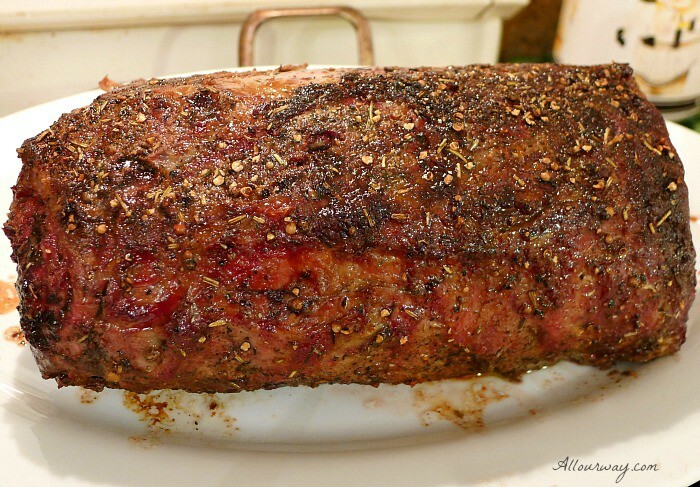 The roast has the perfect exterior texture and your photos are amazing! I love the seasoning you make for the roast, so flavorful! Wow! What a gorgeous piece of meat — this looks worth of any holiday or celebration. Seeing this beautiful roast is getting me so excited for the holidays. It looks like the perfect dish for Christmas. I love a good roast and this one looks amazing. Thanks for an amazing recipe.